For some, their career is something born out of aspiration; for others, it’s a path they’ve fallen into. Bina Mehta’s 25-year career in higher education is the way she aspires to express her personal identity and carry on a familial legacy. 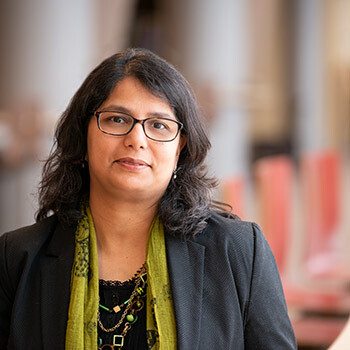 In recognition of her breadth of educational accomplishments at Laurier, Mehta was the 2018 part-time recipient of the Donald F. Morgenson Faculty Award for Teaching Excellence in the sustained excellence category. Ali Zaidi, Laurier associate professor and 2017 teaching excellence awardee in the internationalization category, nominated Mehta. His nomination was based on Mehta’s ability to inspire her colleagues through her own practice and her distinct way of mentoring and caring for each student as human beings – not just as students. Mehta was born in Nairobi, Kenya, and comes from a long line of teachers. Her family runs a primary school in India, and up until a few months ago, the chance to visit her ancestral homeland had not yet presented itself. The opportunity fell into place when Mehta partnered with John Abraham as the co-instructor for the summer 2018 Global Studies Kerala field course. While she joined the group in a teaching capacity, Mehta reflects on the time in Kerala as a significant moment in her personal learning. Mehta’s honest and self-reflective way of engaging with this transformative learning environment in Kerala enhanced the experience for students in the group. That students acknowledged and appreciated Mehta’s empathic nature is a testament to the impact of her teaching approach both abroad and on campus. Students credit Mehta for encouraging a diversity of thought and approaches in the classroom. A second-year course taught by Mehta titled The Cosmopolitan Village? invites students to discuss the dreams, visions and imaginings of a shared global culture. The course also challenges students to consider the place of culture and race in the process of globalization, which can simultaneously unite and fragment the world. The creative final project for the class was a “cultural food jam.” Students prepared food, photographed it, and presented their experiences in creative ways that conveyed the choice of their dish in critical connection to both the course content and culinary memories evocative of their life stories. First-year students in Billionaires, Beavers and, Banditos, a North American Studies course Mehta co-developed with associate professor Kevin Spooner that’s intriguing both in name and in its partially online delivery method, are encouraged to consider how their life experiences inform their academic pursuits. Another of Mehta’s North American Studies courses, delivered in cooperation with Laurier International for international degree-seeking and exchange students, brings together a diversity of students from outside of Canada during their studies at Laurier. The course gives international exchange students a chance to learn about Canadian culture and provides a forum for them to share first-hand accounts of the way diversity, multiculturalism, and Canadian norms are perceived in their home countries. “To be the only Canadian in the room getting to learn from students who have seen and experienced the concepts in a different way all around the world is humbling,” says Mehta. Just as many academics take into account how historians, political scientists, and business leaders may look at a particular moment in time or issue differently, Mehta values the multitude of student perspectives. She takes this validation one step further. Mehta mentors some of her Canadian and international students by preparing them to deliver guest lectures in her courses. For her, this is another way to have learners really understand the importance of interdisciplinary studies and the life stories of others in a globalized world. Mehta says her students bring a vast spectrum of existing and potential learning to the table, and she’s not afraid to dedicate class time to student stories because theirs are perspectives worth sharing. “It’s this human connection that propels me,” says Mehta.